I really wish I could give you step-by-step instructions, but I’m a dumper. I rarely measure…although I tend to be better at it when I’m trying to “be good”. 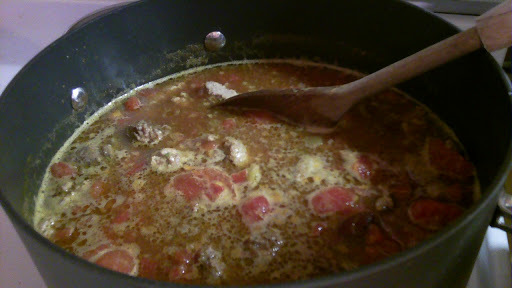 Essentially, you brown off the meat and then add the rest of the ingredients (I rinse the beans) – I’ll add 2-3 cans of water and then let it simmer for awhile so that the flavors can marry (usually an hour, but it really doesn’t take that long). I suppose you could serve this with the sides that you would use for chili, but I don’t. It tastes great right out of the pot. I'm a dumper, too 🙂 This looks super easy and good. Will test on my guys. mmmm this looks good! I'll have to try it also!